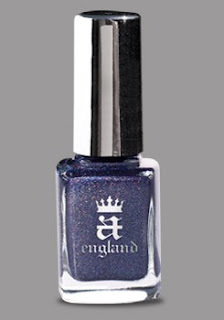 I finally got my first A-England nail polish! I went with Tristam and it's so lovely! Apologies for the messiness of my nails, it's a reflection on me, rather than the polish! I found this heavenly. It applied very well, and I almost didn't want to use a top coat as it was so shiny. I also found this lasted a while before chipping (I believe it was 4 days before minor chips, but with touching up, or if I'd topped up the top coat it probably would have been longer). Tristam and other amazing colours are available from A-England for £9.00 each. I couldn't review a nail polish called Tristan without some music from Richard Wagner's Tristan und Isolde. Love this song! I love that shade of blue, but the glitter finish isn't to my taste. I haven't heard of this brand before now either, so I'll look out for it.